The City Temple of Baltimore (Baptist) was built in 1870 as The Eutaw Place Baptist Church. It was designed by world famous architect Samuel U. Walter. The first organ in the church was installed in the rear balcony. Parts of the mechanism of the old water motor are still attached to the wall. The casework and much of the pipe work was installed in the early 1890s and remain today in its original position. This is the work of Adam Stein of Baltimore, who was employed in the Baltimore branch of the Roosevelt Organ Co. Upon the death of Mr. Roosevelt and the closing of the factor, Mr. Stein continued to build in the Roosevelt tradition. This is the secret of the tonal breadth and dignity of our "Miracle Organ." 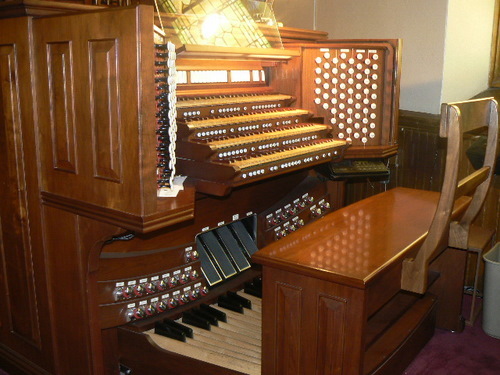 In 1947, the Wicks Organ Co. of Highland, Illinois rebuilt the organ, electrified the chest with direct electric action, installed a new three manual console, unified the dulciana on the choir, added a concert flute, clarinet and extended the great gemshorn. When City Temple purchased the building in 1970, the organ was almost unusable. We were fortunate in securing the services of the late Mr. Ernest Hornig and Mr. Ronald Unger of the Shantz Organ Co. to restore and maintain the instrument. The late Rev. William W. Payne (organizer of City Temple) and organist Kenneth M. Dean indulged in bold dreams and grand illusions about the organ. The Pastor learned that the organ of James Chapel of Union Theological Seminary in New York City was being replaced. Generous members of the congregation donated ranks of pipes of the New York organ as memorials to their departed loved ones. Their names are inscribed on a plaque in the foyer of the church. For their vision and devotion, we are eternally grateful. The old Seminary organ contained much beautiful (almost priceless) pipe work—having been built by the Austin Organ Co. in 1912 and later enlarged by M.P. Moller in 1940, and again in 1960. We called it the "Miracle Organ" and some even called it "Payne's Folly"; but, the "Dream Organ" became a glorious reality. Upon learning of the closing of Old St. Gregory's Catholic Church, we opted for and secured the "Double Moller Artist." For the additional stops, a larger console was essential. After being told by the M.P. Moller Co. that a suitable console would cost more than $15,000.00 and that it would require more than a year to build, God provided another "miracle." The Old St. Paul Church had recently bought a new console. We secured their old E.M. Skinner four manual console for $200.00. Truly this was still another "miracle." 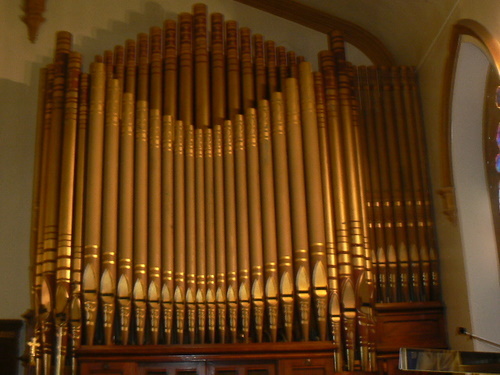 The organ has been enlarged by the following additional pipe work; a four rank mixture, which is exposed on the outside of the case, was added to the great. It adds a bright tap to the entire organ. Twelve new trumpet pipes were installed to provide a double reed to the pedal. The Moller Artiste from St. Gregory's has a pair of strings and French trompette in one chamber and a baroque flute, a Nazard and principal in the other. This creates an excellent antiphonal section and is also playable from its own two manual console in the gallery. The excellent strings from the old 1912 Austin are big, warm and rich. The sixteen foot Violene speaks from the gallery placed around the rose window. It is a soft but "telling-voice" in the pedal. The Gamba Celeste four foot flute, Moller Octave, and three-rank Plein-Jeu (which adds fire and brilliance) are in the swell. From the old organ in the Faith Baptist Church we retrieved the soft, lovely Vox Humana, which imitates the human voice, along with the xylophone. Through the efforts of Lois E. Smith, organist, these were obtained in 1982, through the benevolence of the Elizabeth L. Phillips Funeral Home, P.A. The pipe work of the Positiv division which is enclosed over the baptistery was given by Pastor Payne in memory of his parents. It is by Moller and comprised of the following voices: Gedeckt-8', Nachthorn 4', Principal 2', Quint 1 1/3', Sifflote-1' and a small 4' baroque reed. Much of the pipe work is written in the German and French language, indicating their origins. We are indebted to the late William Coleman and other volunteers, including Kenneth Dean, Minister of Music, who made the trips to New York to deliver our precious cargo from New York to Baltimore. Orchids to Mr. Ronald Unger who installed the additional pipe work and who has maintained the organ through the years. The lovely music of our "Miracle Organ" sings and soars from every corner of the church—leading us in praising our God from whom all blessings flow. 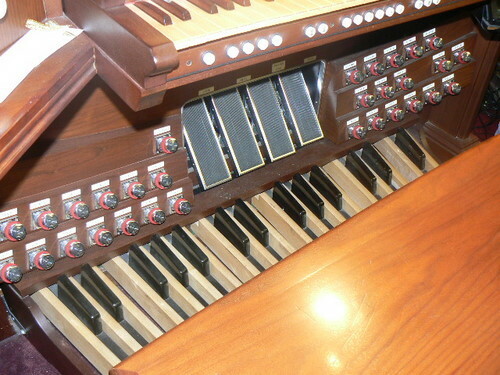 The Rogers Organ Company of Portland Oregon was contracted to build a new four manual, state-of-the-art console, and with Midi capability, eliminate all unification and add additional voices, bringing the size of the organ to 244 ranks. In 1995, Ms. Diane Bish was recitalist for the rededication of the Temple Organ. As the organ has evolved as a great instrumentalist with many voices, built by many builders, across many years, may its music challenge us to join our hearts, hands, and voices to make glorious and harmonious under the master-touch of Jesus Christ our Lord. "Let everything that hath breath, praise the Lord."